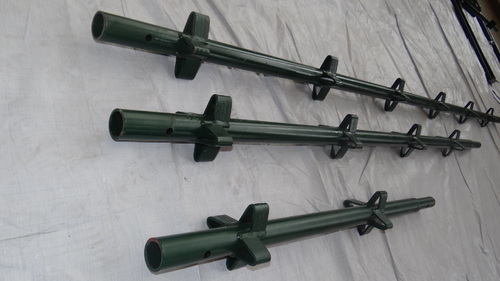 We offer a wide variety of Cuplock System that can be manufactured according to client’s requirements. Known for high quality and superior performance standards, these are available in various dimensions as per clients given specifications. We offer this Cuplock System in a wide range of sizes, shapes and models at highly competitive prices. 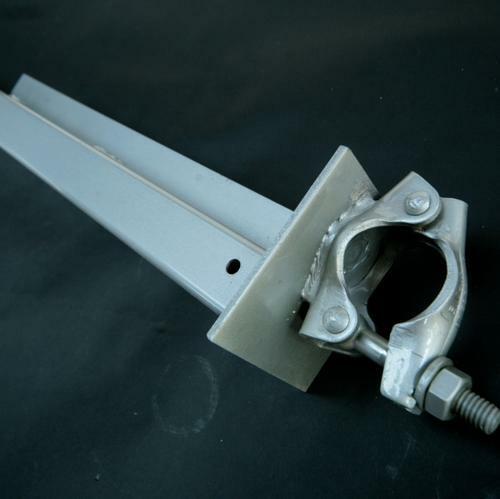 The Cuplock transom is produced using conjoint twin structural angles fixed together and have a drop forged blade attached to each end. The 2.44m cuplock transom incorporates additional web member welded below the flange section for increased strength. The forged blades of the transom are fitted into the bottom cup and are secured using the top cup. 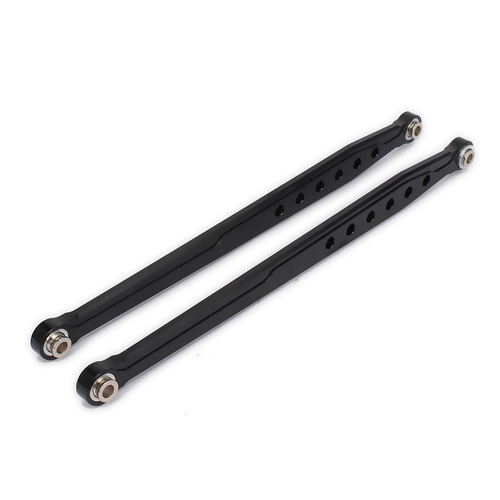 The outside standing bottom leg angles sustain the steel planks in confined manner. 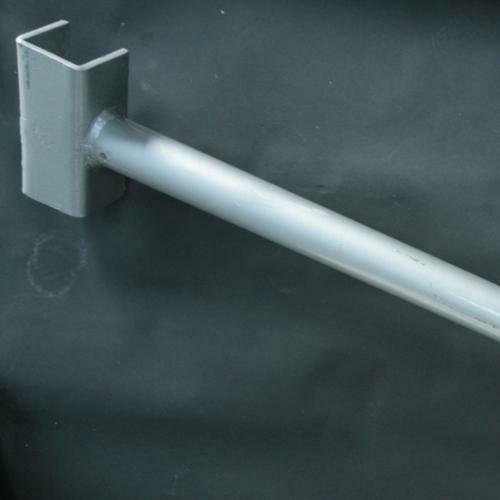 The Cuplock transom is available in various lengths to suit scaffolding and Formwork applications. 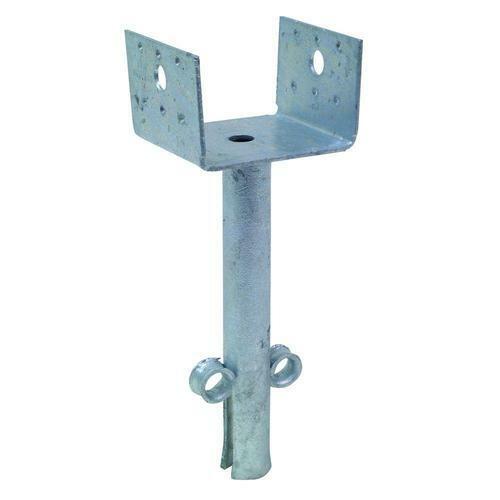 The Cuplock Omega Transoms are manufactured from press bent section with flange type extensions on either side provides a reinforced back up to working platform with cuplock steel battens. These Cuplock intermediate transoms are used with Hop-up brackets. They are useful to make up for the distance between standards if it exceeds the span of scaffold boards. Cuplock intermediate transoms are used to secure the 2 boards and 3 boards. 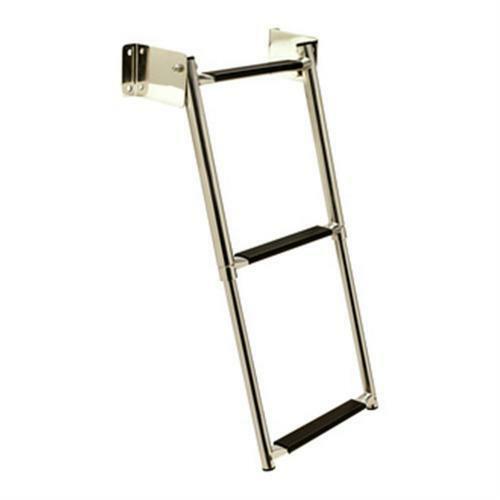 The Ladder Access Transom can provide a gap in a bay to allow a ladder to pass through it. The Ladder Access Transom is connected to and spans between the ledgers in the bay. 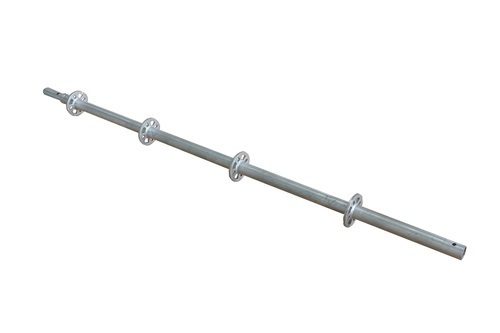 The hop-up brackets allow the 1, 2 or 3 plank broad platforms to be placed between the workplace and the scaffold. 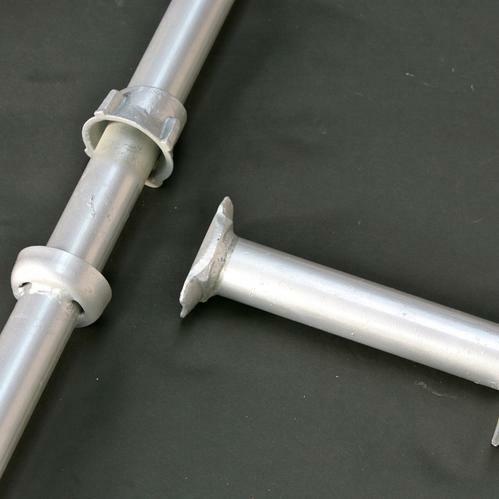 The blade end is fitted into the cup on the standard and the ends of the brackets are connected to each other with the help of Tie Bars. 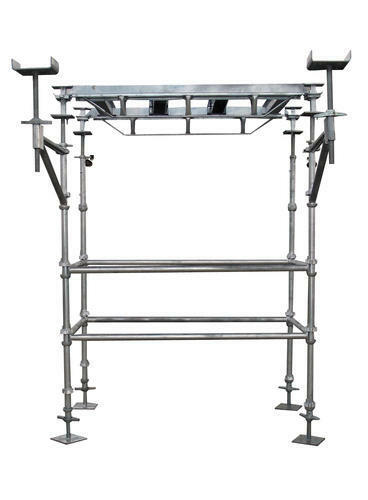 The Cuplock Scaffolding bridging horizontals provide complete working platform with necessary guardrails for safe vehicle passage. The Cuplock inside board transom can be used with Hop-up brackets to cover the distance between standards if it exceeds the span of scaffold boards. The range of Quiklok intermediate transoms are available for 2 boards and 3 boards. 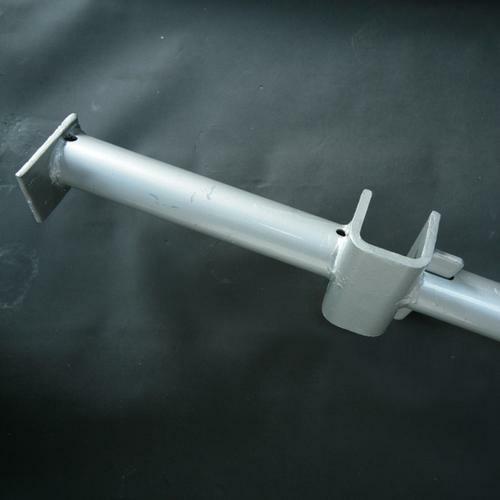 The brackets have a solid stem of 35mm specified diameter with a nut restraint to guarantee the stem always has a least engagement into the standard of 150mm. The U-Head is capable of supporting twin 100mm wide bears. 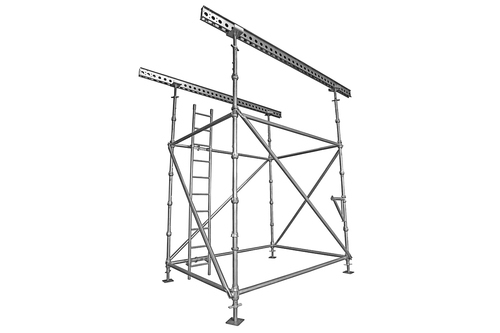 The Cuplock Bracing is used for diagonal bracing of scaffolding. A diverse range of longitudinal braces made out of 20 mm N. B. 'L' tubes with swivel forged blades at each ends to be fitted into cups of Quiklok standards are available. 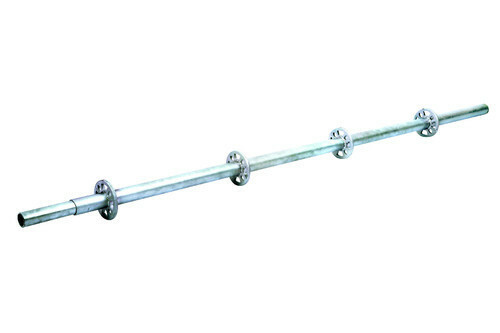 The Cuplock Cantilever Frame is used for providing support to the platform or Formwork at edges. This frame has ledger blades to be fitted into cups of Quiklok standards at one end and with provision for positioning jacks in three positions at the other end at 1.2 m, 1.25 m and 1.3 m from centerline of the standard.